Calves and heifers need nutrients to grow. Although this statement may seem like common knowledge, applying it to calf and heifer programs is not as easy as it sounds. Nutrients are valuable, which means it costs money to feed additional nutrients. Whether the nutrients come in the form of milk replacer, calf starter, minerals or forages, they all come at a cost. Raising heifers in a cost-effective manner requires a focus on strategies to reduce the costs per pound of gain instead of only paying attention to daily feed costs. 1. Calves need more nutrients to grow faster. Growth and average daily gain are based primarily on how much energy and protein the calf is consuming. Calves need to consume large amounts of nutrients to achieve growth rates outlined in the Gold Standards of doubling birth weight by weaning and being 55 percent of their mature weight at first breeding. One of the challenges to getting calves to consume enough nutrients is intake. Young calves will only consume a small amount of solid feed and may not always consume enough nutrients to maintain or achieve target growth rates. 2. Feed efficiency is not the same for all feeds consumed. The digestibility and availability of nutrients can vary greatly for different feeds. For example, the nutrients in milk are much more readily available to a calf for growth than the nutrients in calf starter. Therefore, if a calf consumes 1 pound of milk, it will have much better feed conversion than a calf consuming 1 pound of high-quality starter grain. Similarly, feeding grain results in improved feed efficiency per pound of gain as compared to feeding forages. The efficiency of growth for different feeds is especially important to keep in mind when it comes to post-weaned and growing heifers. 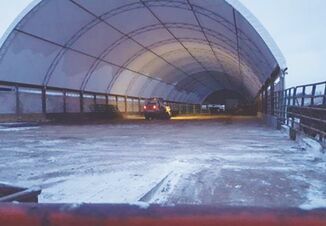 The complication is that feeds which are typically less efficient from a feed efficiency standpoint are often less expensive. Low-efficiency feeds are why determining the cost per pound of gain is important. For example, let’s say we have two heifers eating 12 pounds of feed per day. Heifer A is fed a diet that allows her to gain 1.8 pounds per day and costs $160 per ton. Heifer B eats the same amount of feed, but a higher quality diet with greater digestibility and nutrient concentration allowing her to gain 2 pounds per day. Even if the diet for Heifer B costs $175 per ton, it will be less expensive ($0.533/lb. gain for Heifer A as compared to $0.525/lb. gain for Heifer B) to feed the heifers to the target breeding size of 55 percent of their mature body weight. 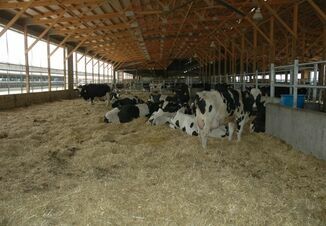 Heifers do not grow at the same rate throughout the growing period. Younger heifers can grow frame and increase muscle growth more quickly than older heifers. Once heifers reach puberty, the rate at which they can increase frame growth slows down tremendously. Because of this natural growth curve, taking advantage of opportunities to increase growth rates early in a heifer’s life can be advantageous for both the overall growth rate and cost-effectiveness to achieve each pound of gain. Raising heifers is a balance between nutrition and economics. Heifers need to be fed a ration that provides them enough nutrients to keep them growing and healthy. But, the costs to achieve those gains are also an important consideration. Using diets and feeding strategies to reduce the cost per pound of gain plays a valuable role in developing an efficient dairy heifer growth program.